The press release states that Eritrea view the initiative launched by the Kingdom of Saudi Arabia to form an alliance against terrorism as a vital step in the promotion of peace and stability in the region and the world as a whole. Eritrea believes the initiative is part and parcel of ongoing endeavors towards the establishment of broad strategic cooperation to combat terrorism and lawlessness and thereby guarantee peace and security in the region. President Isaias had left to Riyadh for a three-day working visit on Saturday, December 19th. According to State media, the two leaders discussed on ways and means of coordinating the fight against terrorism besides talking on regional and international developments of mutual interest to both countries. 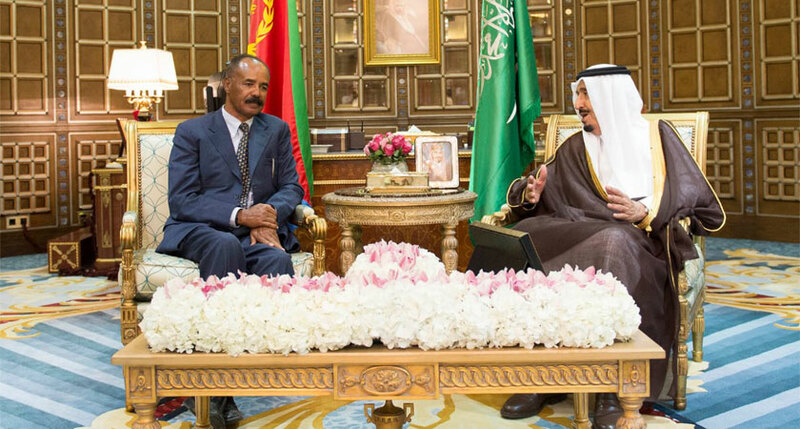 President Isaias Afwerki also held similar talks with Deputy Crown Prince and the Minister of Defense of the Kingdom of Saudi Arabia, Prince Mohammed Bin Salman. Last week, Saudi Arabia announced the formation of a 34-state Islamic military coalition to combat terrorism that includes nations with large and established armies such as Pakistan, Turkey and Egypt. The joint operations centre will be based in Riyadh.